Well, we have been using TSMManager for some time now and I have to say I rely on it a lot for day to day monitoring of our servers. Our environment is pretty large so we need something that will allow us to see problems quickly and easily. TSMManager has a slew of tools and the interface is fairly easy to use. We have a number of Jr. level admins who are able to handle multiple TSM servers with TSMManager's help. The key piece of TSMManager is the administrators console. It is a tabbed interface that allows me to see things at a glance without having to query the activity log in search of the problem. The first tab is basically the admin interface running in console mode. The second tab is the greatest gift to admin in that it is an error tab. 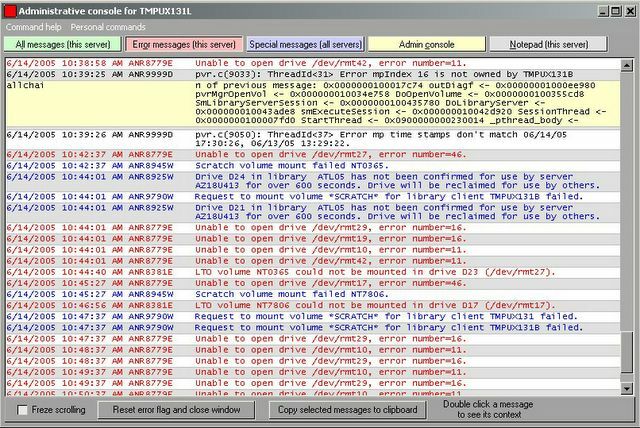 It parses out the errors and shows all warnings, errors, and severe errors. This is the error tab. Click on it and you'll see how it consolidates all errors into a simple interface. Great for those times you're having server issues. I also use TSM manager. I love the product, it makes daily operations and reporting very simple. The only problem is the chance of growing dependant on the interface and forgeting commands. I agree with you, but Tivoli already force that on us with 5.3.